Well, I believe my quest is at an end. 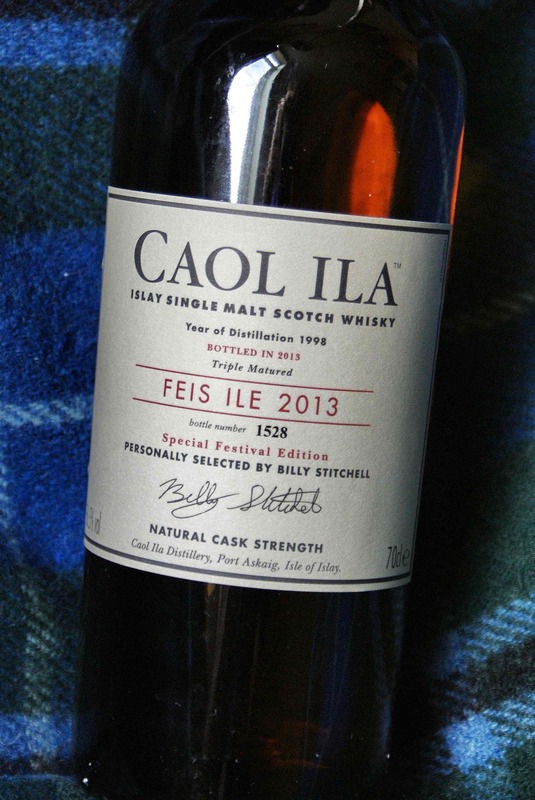 I have found the perfect Caol Ila, and I had to go all the way to the source to find it. The annoying thing is that it’s a limited release, available – probably for a very short while – from the distillery shop for £100. Or, for £200 if you want to buy it from Master of Malt. Though I’ve seen it a touch cheaper elsewhere. 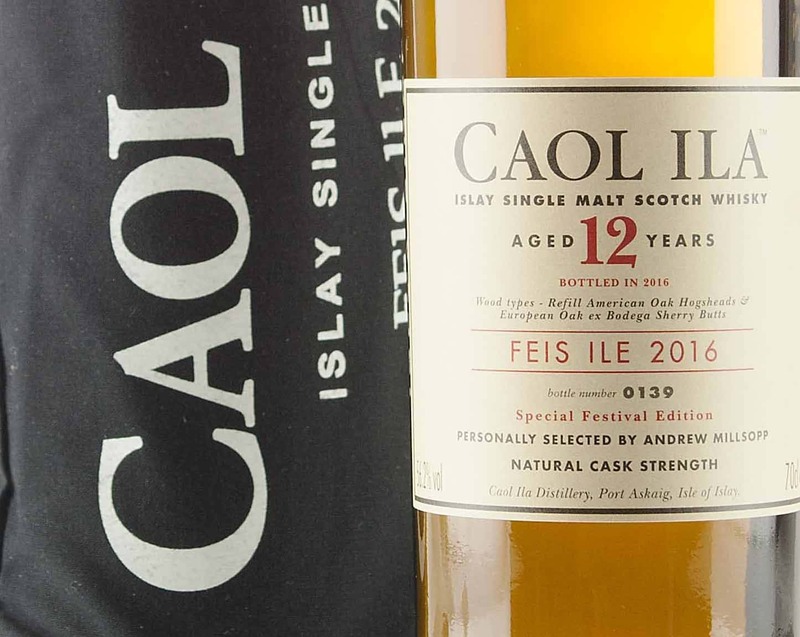 Feis Ile is the Islay festival, and each year some of the distilleries on the island make a limited release. The releases are highly exclusive, and bottles are usually snapped up straight away – which is why I was very surprised to see this bad boy sitting on the shelves. 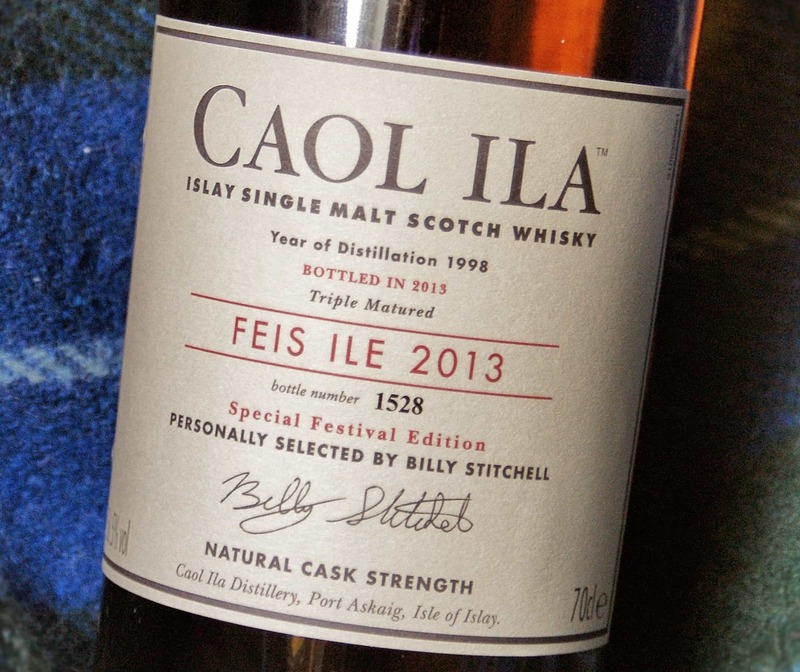 The Caol Ila Feis Ile 2013 is a limited release of 3000 bottles. It has been distilled in 1998, and is triple matured whisky. That’s 12 years in refill butts (I *think* from my Caol Ila tour this is second-fill bourbon and grain whisky casks, though could be wrong); then in ‘active hogshead casks’; and finally in European oak. Bottled at a thoroughly respectable 56.5% ABV. Colour: a gentle sunsety amber. On the nose: firm sweet peat fires. Burning embers at first and then leading to molasses. Very bold indeed. Then come the floral aromas, gentle, but this is a wonderfully balanced peat and treacle nose for me. Marmalade. Orange zest. Distant mossiness. In the mouth: oh the texture. That’s just so nice. Silky, yet maintaining a firm grip on all the important parts of your tongue. Perfect, perfect spice and sweetness assail simultaneously. All that nose comes through (one of the things I love about a whisky – when that continuity is there) and the mixture of smoked applewood cheese, raisins, cherries, oranges, hints of grapefruits, but very distant. Touch of port and pepper. Syrup. Such a bittersweet finish, too, edging out towards the sweet. That silkiness is still there – you can feel it between your teeth. It’s absolutely sublime, deeply subtle – very clever stuff. All the while, you’re being prodded with that syrup-sweet peat. But it’s not overwhelming, or never is the smoke harsh. It’s got its arm around you, like an old friend. For those wanting a comparison, think Ardbeg Uigeadail, but a little classier and cooler. 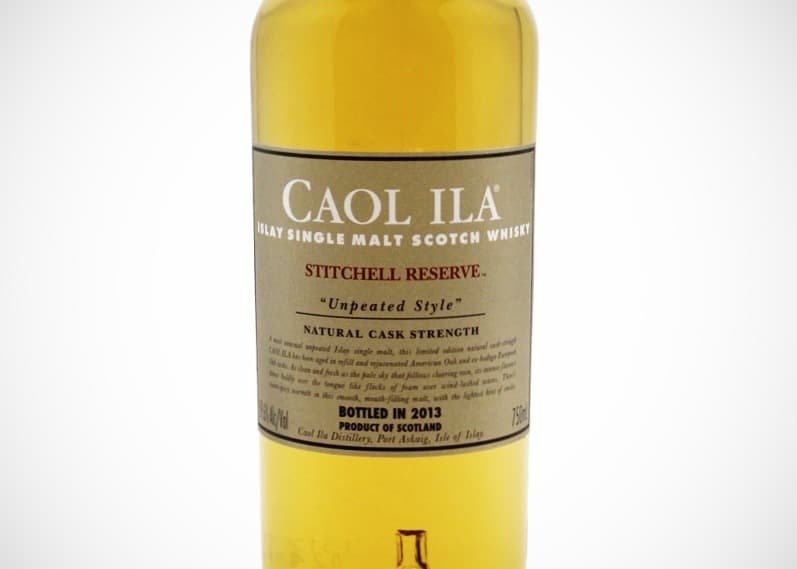 That was one of my favourite whiskies, but I think this Caol Ila might just surpass it. The best whisky I’ve had this year, period. And, after second and third contemplations, I can very much confirm my opinion. This is what Caol Ila is capable of. For heaven’s sake, Diageo, unshackle this distillery and let it create single malts. You’d wipe Ardbeg off the map!